A surprise feature buried in the new PlayStation 4 version of Rise of the Tomb Raider appears to show just how much of your real-life playing area can be tracked by Sony’s new PS VR set-up. 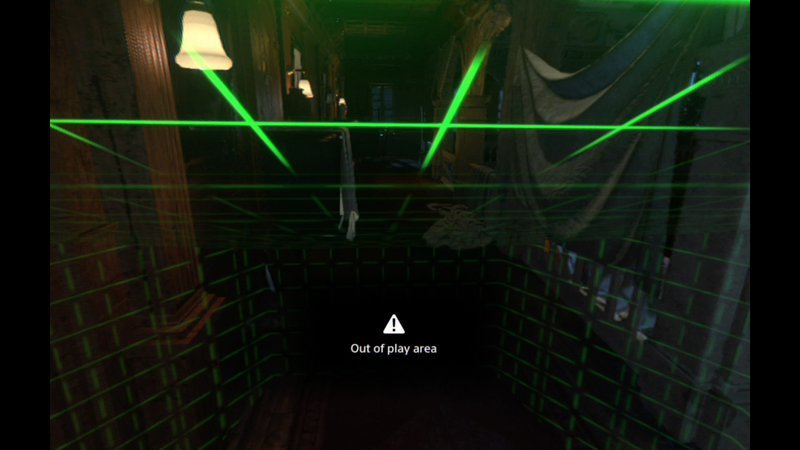 An option called “Visualize Play Area” makes the game’s VR-compatible Blood Ties expansion display green grid lines if the player moves their head or body too far out of the proper playing area. It is presumably showing the limits of what the PlayStation camera–which is mounted in front of a PSVR player and which tracks the PSVR headset and the player’s controllers–can reliably track. You can see a short clip of me testing the visible range below. In the clip, I’m standing and playing the game in my living room at home. I walk laterally along the width of my couch to find the outer border of what the PSVR set-up can track and look back at the space. Notice that the trackable space has a sloped ceiling and sloped floor. The PlayStation camera only see high and low so far. Most PSVR games discourage a lot of player body movement, and the system is designed for stationary standing or sitting play. The grid lines in Tomb Raider are a helpful way to tell if you’re close to exiting the system’s trackable play area. I was able to use those grid lines to test numerous positions for the PlayStation camera until I had maximized the amount of trackable space in my room. I was also better able to discern what the camera could and couldn’t see if I was playing a seated experience vs. a standing one. Given how useful the option is, it’s surprising that, of the dozen or so VR-compatible PSVR games we’ve tried, this is the only one that has the grid-line option. The green grid lines in Rise of the Tomb Raider’s VR mode seem to match the parameters sketched out in the PSVR manual. Unlike PSVR, HTC and Valve’s competing virtual reality headset, the Vive is designed for “room-scale” VR. Before a user puts on the headset for that kind of experience, the Vive and has users measure their playing space by walking a controller along the perimeter of a cleared area. Once they are wearing the headset and in VR, the perimeter of that playing area will show up as blue grid-lines if the player gets close to the edge. That grid keeps the player in sensory range, but also keeps them from tripping over furniture or smashing their hands into the walls or their monitor. Knowing your literal limits in VR is a good thing. It should be standard for all systems and set-ups.